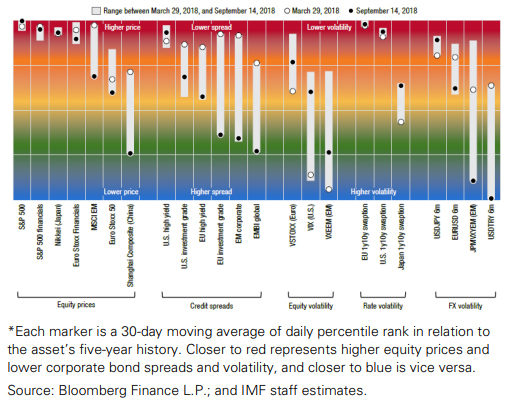 The IMF Global Financial Stability report, released on 10 October, highlighted an increase in the level of risk among multiple global metrics. Following its publication, stocks in the US, Europe and Asia lost 4%, 3% and 4% respectively over three days. While the market has regained some of its early losses, we believe the report and the subsequent market pullback underline the relevance of holding gold in the near and long term. Last week stocks sold off, and gold acted as a key flight-tosafety asset in the market. Initially, as the US market retreated, gold held steady. But as the sell-off became more systemic globally, gold began to rally meaningfully (Chart 1). Gold has fallen by more than 11% from its April high and is currently around 7% lower y-t-d amid bearish investor sentiment. 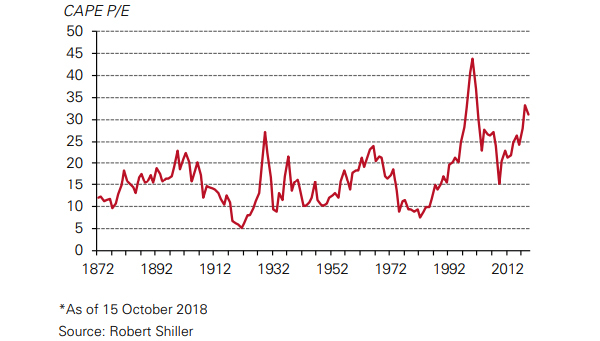 Much of this performance has been driven by a risk-on appetite in the US, where the dollar – which historically is inversely correlated to gold – has appreciated by 7% since early Q2 (Chart 2). 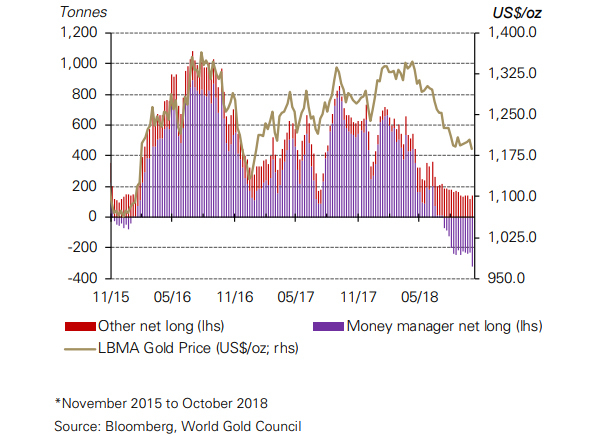 Additionally, the positioning in the gold futures markets in COMEX – the largest and most liquid gold futures market in the world – has seen record short positioning (Chart 3). Money managers’ net shorts are near record lows since data became available in 2006, and the net speculative position from the legacy COTR-- which we define as the sum of the non-commercial and non-reportable positions-- is near negative levels last seen in 2001. These headwinds for gold have been warranted. 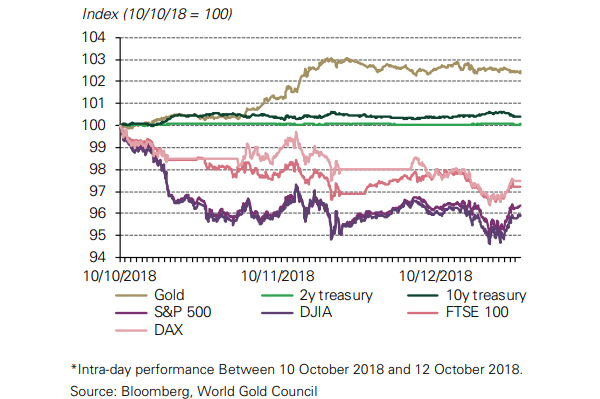 But as the IMF signalled in its 2018 Global Financial Stability Report, an increase in commonly used metrics of risk highlight the relevance of including gold in a portfolio both for the near and long term – from a tactical and strategic perspective. The IMF report is not just about a heightened level of risk in the global economy, although that is its main conclusion. It also discusses factors that could point to a stronger global economy. Banks are stronger now than they were during the financial crisis – they are subject to greater supervision and regulators have curtailed shadow banking. Although not completely crisis-proof, it appears that in any future recession or financial crisis banks would be in a much better position to stomach the pain. Developed market (DM) economies have improved. If this growth were to continue, additional investment could be created in stocks and other riskier assets, thus reducing the focus on gold as a safe-haven or tail hedge. In addition, US dollar strength has continued. While trade wars could create a long-term negative impact to the global economy, so far, the US ‘America First’ policy has benefitted the dollar. Set against this, concerns about the resilience of emerging markets (EM) have affected those countries’ stock markets as well as their currencies. Combined, these factors could continue the US dollar’s run, creating headwinds for gold. The global economic recovery has been uneven. In its report, the IMF highlights the dichotomy between developed and non-developed economies (Chart 4). DM countries have thrived while EM ones have struggled. In part, this has been driven by rising rates led by a Fed tightening stance with the potential to lead to inflation. Additionally, out of all the major economies, the Fed is hiking steadily and may need to accelerate. This has led to outflows from EMs and a stronger dollar. In addition, there have been specific concerns about some EM countries, such as weakness in China and broader market concerns in Turkey and Argentina. While some of this weakness has affected other EM countries, continued softness could spill over to DM countries, increasing the likelihood of global systemic risk. But complacency could creep in after sustained years of one-directional movement in the stock market. Trading volumes have been light and liquidity under stress has not been tested in over a decade. 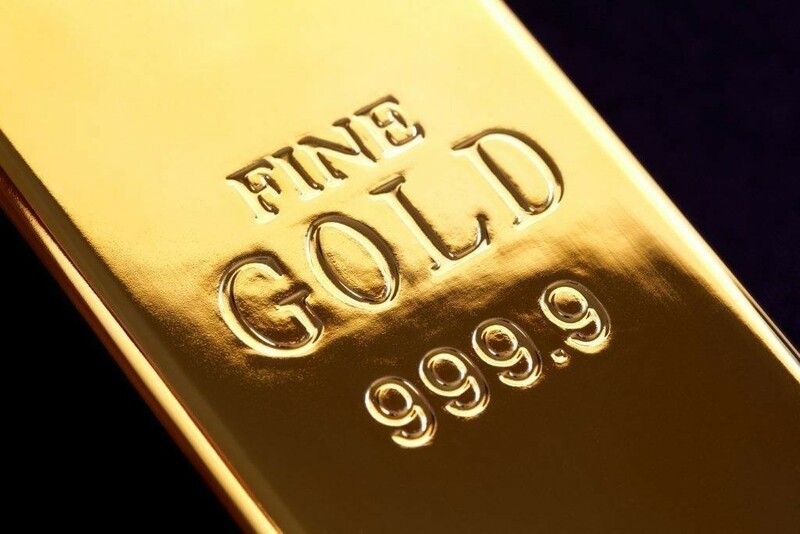 Gold is one of the most liquid assets in the world and could be sourced should we enter crisis times. Market valuations are at extreme levels. When we examine the CAPE ratio – the P/E ratio based on inflation adjusted earnings over the past ten years – we can see heightened levels (Chart 6). One reason to examine this ratio is that it smooths earnings over time, removing some quarterly noise and including an inflation component relevant to gold valuation. The only time this ratio was higher was during the dot-com bubble and all other periods of elevated levels have preceded sharp market sell-offs. Debt has exploded over the past ten years with various forms of quantitative easing across the globe (Chart 5). Non-financial debt in jurisdictions with systemically important financial sectors has grown to over 200% of GDP and, with rates rising, could become more and more costly to repay, putting a strain on country health. A prolonged continuation of trade tensions is also likely to hurt long-term economic growth, as the effects of higher tariffs could have an impending negative outcome on overall GDP. 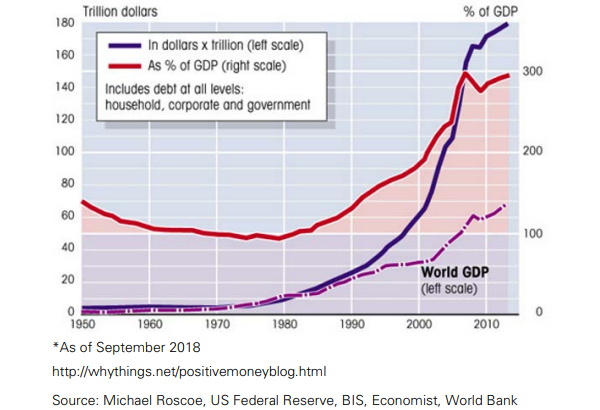 Global credit market debt owed*. The positive link between global economic expansion and gold has, historically, provided an important contribution to its long-term performance. But its role as a diversifier and tail-risk hedge has been fundamental too, and its price has been boosted as markets have faced systemic risks. 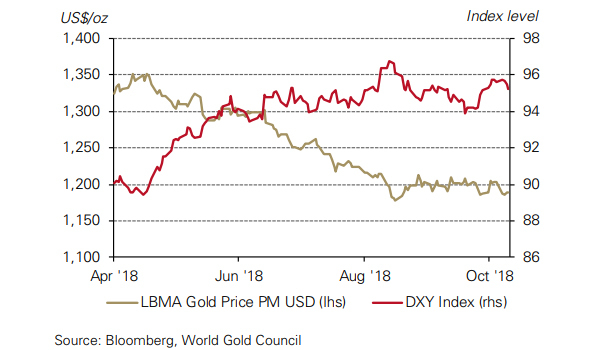 While there have been headwinds for gold over the past six months, there are clear reasons, based on the IMF’s most recent report, for gold to move upwards. The global economic recovery has been uneven, hurting EMs; complacency has crept into the market, questioning liquidity; market valuations are at extreme levels; debt has grown substantially globally, and increased tightening could hurt markets. All these factors, either individually or in combination, could be catalysts for a risk-off environment that could propel gold higher. This article is a re-post from here . The original article also has detailed Notes and Sources. Our free weekly precious metals email brings you weekly news of interest to precious metals investors, plus a comprehensive list of gold and silver buy and sell prices. To subscribe to our weekly precious metals email, enter your email address here. It's free. The 'Gold - NZ$ & US$ per ounce' chart will be drawn here. The 'Silver - NZ$ & US$ per ounce' chart will be drawn here. The 'Platinum - US$ per ounce' chart will be drawn here. The 'Platinum - NZ$ per ounce' chart will be drawn here.